The ever-maturing downloadable space has allowed for some rather niche genres to find their audience. From The Legend of Grimrock to Lone Survivor, players can find new games for their favorite genres for a price that's hard to argue with. Enter The Pinball Arcade, the latest pinball simulation game by FarSight Studios, who are probably best known for their Pinball Hall of Fame titles. 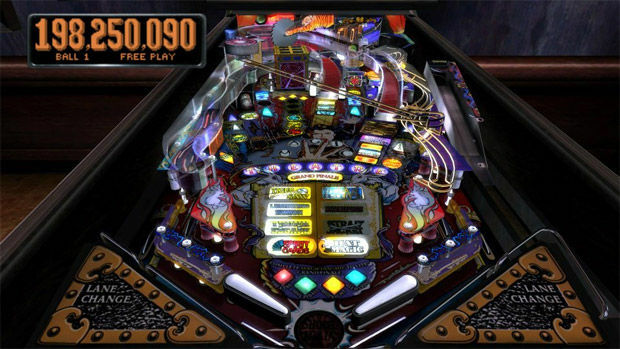 The Pinball Arcade is both a collection of four classic pinball tables, emulated in great detail, and a platform for future downloadable tables à la Pinball FX 2 or Zen Pinball. While the Zen Studios games offer more modern digital incarnations of pinball, The Pinball Arcade is not just a love letter to classic tables, but a product that is overflowing with FarSight's dedication and passion for the favorite pastime of generations who grew up in the tail end of the previous century. The four tables included in the package, Black Hole (Gottlieb, 1981), Theater of Magic (Bally, 1995), Tales of Arabian Nights (Williams, 1996), and Ripley's Believe It or Not! 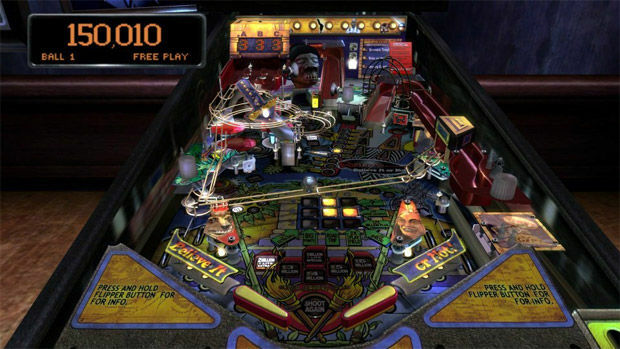 (Stern, 2003), are a mix of classic tables which offer a good variety for fans of pinball both old and young. The most striking aspect of The Pinball Arcade is without a doubt the enormous attention to detail that the four tables sport. Compare the virtual versions to images of their real-life counterparts side by side, and it's evident how serious FarSight is about digitizing classic tables for posterity. In fact, FarSight's mission statement of their goal to create the best pinball simulation stares you in the face upon starting the game for the first time. Suffice it to say that these four tables are excellent. It's important to keep in mind that they come from different eras, and many casual pinball fanatics will likely prefer one table over the other, but each table offers a great deal of fun. From Black Hole with its six flippers and "inverted gravity" lower layer, to the excellent Ripley's Believe It or Not! table which was designed to cater to both beginners and veterans of pinball with its many easy goals, each table offers something unique. Even Theater of Magic's secret "hold right flipper" cheat code, which reveals Mortal Kombat 3 symbols after spelling THEATER, is included in FarSight's virtual emulation. As a pinball simulation, the level of detail and authenticity found in all the tables cannot be praised enough. A pinball simulation wouldn't be any fun to play if it didn't control well, and thankfully The Pinball Arcade succeeds in this regard. The ball physics feel right (compared to what I remember real-life pinball plays like), and the different tables lead to distinct experiences due to their expert design. Three camera modes offer slightly different tilted views of the table, and these can be locked for a more static view with the press of a button. While the different versions on the various platforms are mostly identical in content, there are minor differences. The console controller's triggers may not be the buttons of choice due to their analog nature and the relatively long time it takes to press them down. They work fine, but setting flipper control to the shoulder buttons on both the DualShock 3 and Xbox 360 controller allows for a faster and more direct connection between your hands and the flippers. For both console versions, it's worth pointing out that when displaying the game in 1080p, the playfield of the tables is vastly more detailed and clean than in 720p. 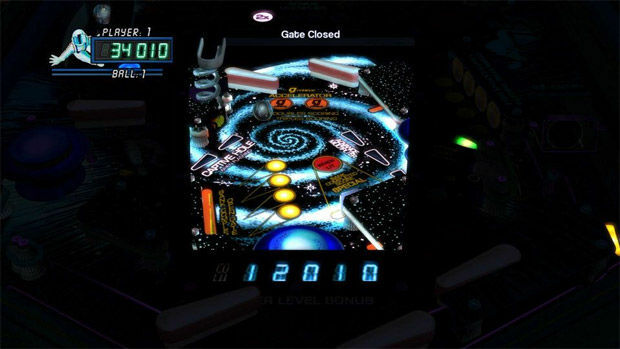 While any game is generally playable enough in either display mode, in 720p The Pinball Arcade makes the playfield detail hard to read, and the classic playfields are filled to the brim with lights and art that you would rather see clearly. On the upside, the dot-matrix display -- which isn't rendered in dots anymore -- looks slightly more dot-ish in 720p compared to the smoother version in full HD. The 360 version is also slightly crisper than the PS3 version, although you'd be hard pressed to notice it, while the PS3/Vita version offers Facebook integration. The latter version also has a Challenge Mode and a Tournament feature, which will both be unlocked at a later date when more tables are available. Challenge Mode will let you increase your level by beating target highscores, while Tournaments will use rules based on authentic pinball tournaments "for prizes and bragging rights." Thanks to the cross-play compatibility on Sony hardware, buying the game on either a PS3 or Vita will unlock the game for play on both platforms. The Vita version is perhaps the most interesting choice, since tilting the handheld 90 degrees to the left lets you view the entire table at a glance in portrait mode. In horizontal landscape mode, The Pinball Arcade is still a lot of fun, but the smaller screenspace certainly has a noticeable effect on play when moving back and forth between a TV and the Vita's screen. If you stick with either version for an hour at a time, though, you won't notice much of a difference. Vertical Vita play also means that the front touchscreen is used for flipper control, while the rear touchpad is used for nudges. However, you can't disable the rear touchpad or change control settings for nudging, making it very awkward to hold the Vita in your hands without making a table go tilt by nudging it inadvertently. Either you need to grab the device and never move your fingers on the back of the handheld, or you have to try and hold the thing without touching the rear touchpad whatsoever. Good luck with that. It's also rather strange that you can only switch between portrait and landscape mode before starting a game on a table, just like it's odd that there aren't more options for control configuration in the Vita version. Hopefully, these options will be added in the near future as new tables become available. Despite being a game about classic tables, modern online leaderboards allow you to compete with weekly, monthly, and all-time high scores of both your friends and random strangers. Scores are only uploaded as long as you are signed in to either Xbox Live or PlayStation Network, which can be a minor obstacle if you forget to reconnect your Vita to PSN after it has gone in standby mode. High scores aren't as in your face as Pinball FX 2, but they work as advertised and are easily accessed from most menus. Because it's a title where simulation is the name of the game, the nature of the tables can be charming to one player and archaic to another. Likewise, the presentation of the package on the whole leaves a bit to be desired in terms of flashy design, and there are no kinds of operator controls or statistics for the tables which you might expect from a simulation approach to pinball. However, having access to a visual guide to each and every goal for these tables, as well as their original promotional flyers, more than makes up for these minor omissions. 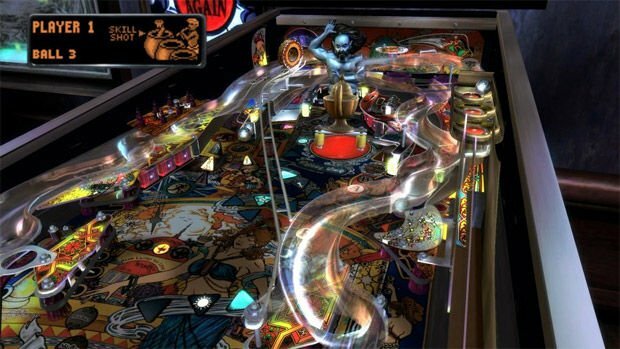 As a platform for classic tables alone, The Pinball Arcade will be a must-have for fans of classic pinball. FarSight aims to release as many tables as they can on a consistent basis, and the first new tables to hit the console and handheld versions in May will be Cirqus Voltaire and Funhouse. There are also iOS and Android versions for those who prefer their mobile gaming device to be pocket-sized. There aren't a whole lot of different pinball games out there, especially with Zen Studios dominating most of the downloadable market when it comes to this niche. 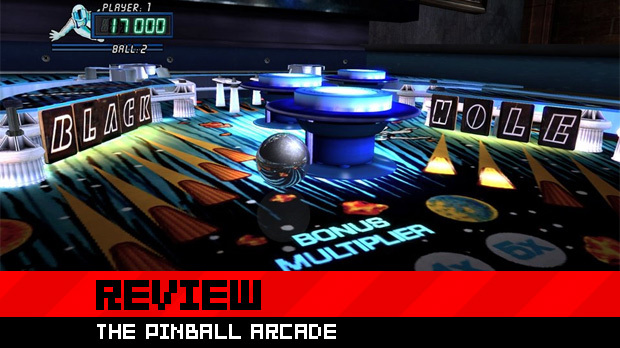 With The Pinball Arcade, FarSight Studios doesn't necessarily offer a direct competitor to the popular Zen titles, but a complementary addition for pinball fanatics that is well worth their time.